When you have a partner you can count on, nothing can stop you! 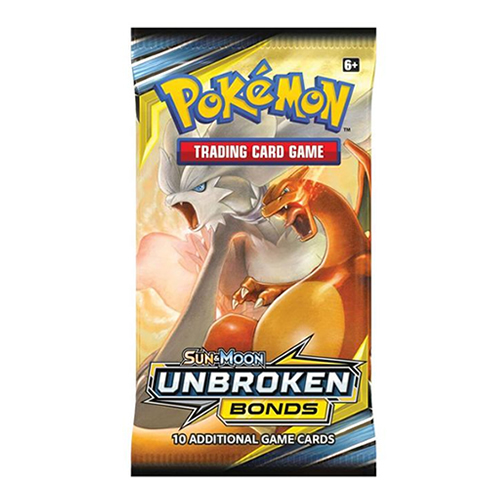 The TAG TEAM Pokémon-GX in the Pokémon TCG: Sun & Moon—Unbroken Bonds expansion show the colossal power of teamwork, including Reshiram & Charizard-GX,the Ultra Beasts Pheromosa & Buzzwole-GX, and Gardevoir & Sylveon-GX…plus, Lucario teams up with the newly discovered Melmetal! With trust and practice, these Pokémon can tackle just about anything, so check out the amazing Pokémon pairings in the Sun & Moon—Unbroken Bonds expansion! 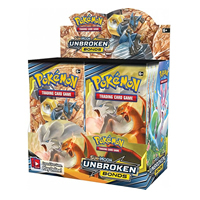 • More than 25 Trainer cards to collect. • 7 brand-new TAG TEAM Pokemon-GX. This item is classed as ‘awaiting stock’, so you can’t add it to your basket today, however, as products that are due in our warehouse shortly are regularly in high demand we strongly recommend ‘reserving’ this item so as to avoid disappointment. Please note, you may be contacted by our sales team shortly before a product is due into stock to verify if the volume that you have pre-ordered is confirmed. When the pre-order has been confirmed then this is classed as a firm order and cannot be reduced or cancelled. In the instance that a confirmed pre order is not taken then Bliss Distribution will not accept any future pre orders on your account.